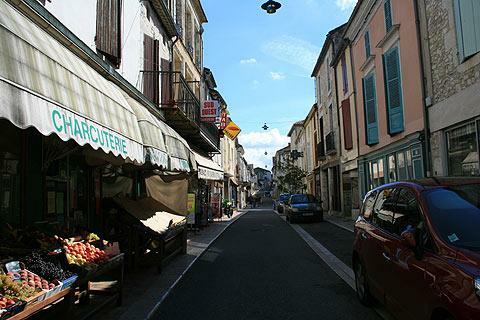 The market town of Castillonnes is about 25 kilometres south of Bergerac and in the northern Lot-et-Garonne department of south-west of France. 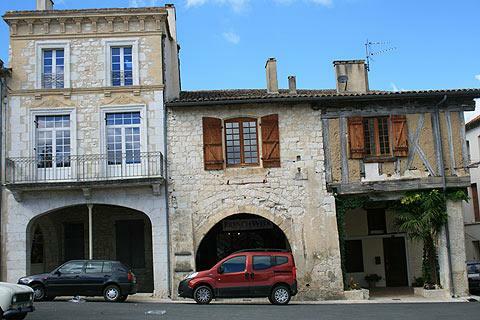 It is one of the many small and attractive bastide towns in the region: it has avoided becoming part of the tourist trail and so even in the summer it remains a peaceful, working French town. Castillonnes dates its founding back to 1259 though before this there was a castle already here. The bastide town was built under the orders of Alphonse de Poitiers. France This Way comment: although Castillonnes lacks the immediate charm of some of its neighbours such as Villereal or Monflanquin, and in truth a visit doesn't take very long, it is still a pleasant town to visit when you are in the region. The centre of Castillonnes is based around the Place des Cornieres where the attractive town hall dominates one whole side of the square. 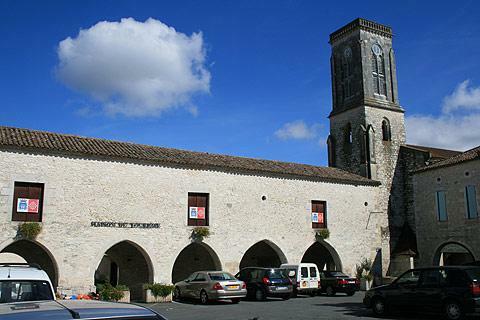 This building originally housed a religious order linked to the abbey of Cadouin. Much of the building was the tithe barn, housing the rents and tithes of the tenant farmers. These would be paid in the form of sacks of grain and casks of wine. 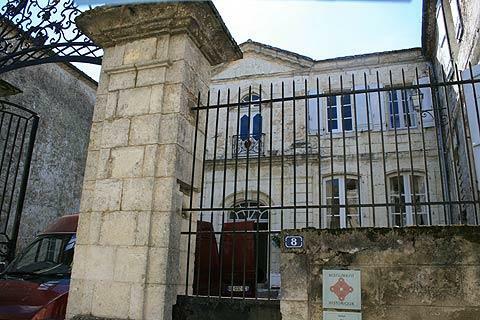 It is now home to the Mairie and the Tourist Office. On another corner of the same square is the church, much of which is fairly new as earlier versions were destroyed in the Hundred Years War and the War of Religions. Inside there is an 18th century Gothic altar and some attractive modern stained glass windows. Adjoining the church is a presbytery dating from the 18th century. Take a look in its garden to see its unusual hexagonal tower. The main street leading out from the Place des Cornieres is the Grande Rue. Every Tuesday morning an excellent market fills the Grand Rue and the Place des Cornieres. The Rue de Guirlity leads to remains of the 16th century ramparts and steep steps lead down to one of the old gateways that originally allowed access to the town. Another can be seen just a little to the left. 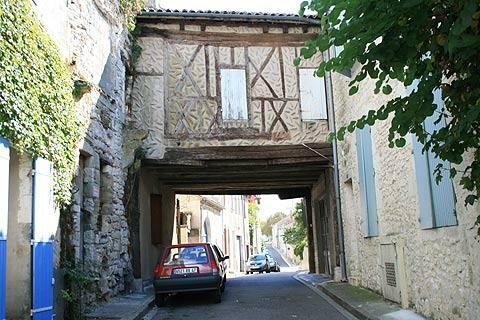 Another road leading out from the square, the Rue de la Paix has a house with a "pontet" extending over the road. 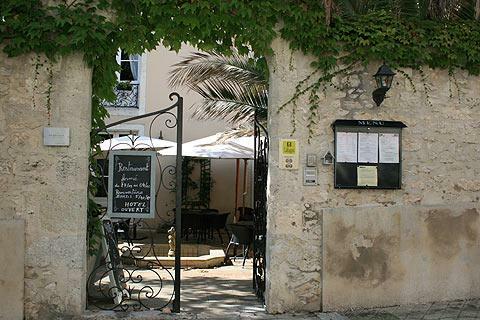 The lovely Hotel des Remparts is on this street. It is a nice hotel and has an excellent restaurant. It was originally a house owned by Baron de Beraud. On the corner of the square with the rue du Lion d'Or is the oldest building in Castillonnes. It is 14th century and has some gothic-style twin windows and at the end a half-timbered building quite common in this part of Lot et Garonne. You are quite spoiled for choice in this region, with several attractive market towns in close proximity. Among the most popular are Issigeac to the north, Eymet to the west and Villereal to the east of Castillonnes: all three of these towns, and several others in the region, are well worth visiting as is the town of Bergerac, a short distance to the north. A seasonal market is held in Castillonnes on Friday.